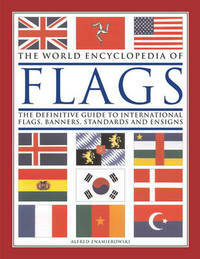 This book is the definitive visual reference to all the international flags. Compiled by a leading authority, the work is an exhaustive and up-to-date summary of world flags, from the largest countries to the smallest states. The extensively researched text explores the wealth of shapes and patterns in flag design, as well as flag-making techniques, terminology, usage and etiquette. Emperors, Sovereigns and Presidents; Government Flags; Military Signs and Naval Ensigns and Flags are all covered, tracing the history and development of the flags. This is both an excellent reference book and an invaluable educational resource. It offers historical, geographical and political insights into one of our oldest forms of identification and communication. Features include: a comprehensive illustrated reference to the flags of the world; discover the fascinating range of flags, including military signs, royal standards, civic flags, naval ensigns and national flags; includes the history of flags, charting their origin and development from as early as 3400 BC; examines and explains the symbolism behind flags; and, over 1,400 colour illustrations. Alfred Znamierowski began publishing numerous press articles on flags in the 1960s, and since 1965 he has undertaken extensive research in Italy, France, Germany and the United States. During the last 25 years, thousands of his illustrations have been published in encyclopedias, books and journals. He has also designed flags and arms for commercial firms and for individuals. He is the founder of the Instytut Heraldyczno-Weksylologiczny (Institute of Heraldry and Vexillology) whose files contain thousands of specifications, laws and regulations relating to flags and arms. In 2001 the International Federation of Vexillological Associations recognized him as a Fellow of the Federation.